Does the NLRB Think Your Employment Policies Are Legal? Do you think all of your polices and handbook statements are up-to-date and legally compliant? The NLRB just might disagree. You have probably heard about the report the NLRB issued on March 18, 2015 that goes through what they consider acceptable and unacceptable policy statements. If you want to comply, you don't want your statements to be too broad. You also don't want them to be interpreted as violating employee's NLRB-given rights. However, you most definitely do not want to forgo having policies completely. So where is the middle ground? 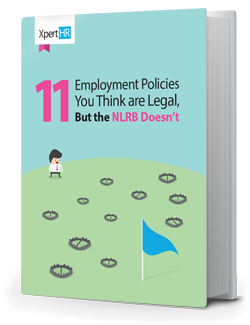 If you want to make sure you are correctly following all of the NLRB's varied requirements, then download this whitepaper today!